Full-featured password manager, with strong encryption and full source code. Store and manage passwords for your internet accounts, PIN numbers, credit cards, etc. 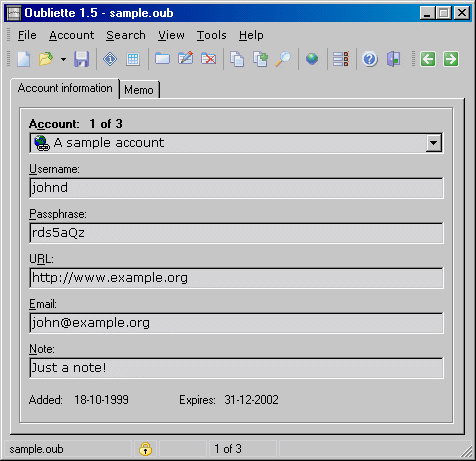 Securely encrypts data with Blowfish or IDEA ciphers, using freeware DCPCrypt library by David Barton (http://www.cityinthesky.co.uk/cryptography.html). Flexible and configurable, easy navigation, powerful search. Group accounts by by customizeable categories. View passwords in a small-footprint interface or in a separate browser window. Easily Copy/Paste information from clipboard. System tray icon and activation hotkey. Exports to a variety of formats (plain text, HTML, CSV, INI). Function to encrypt or decrypt arbitrary files. Full source code included (Borland Delphi 6 required to compile). No nags, no ads freeware.